I'm Joel Balsor, owner and operator of Stockade Style Log Homes; I bring 20 years of professional log home building experience to a project. 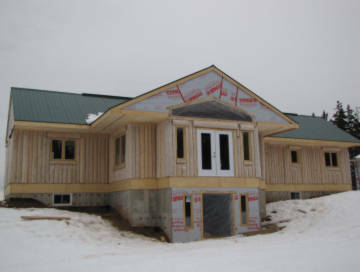 Our projects range from custom handcrafted log wall packages to basic log home maintenance (e.g. exterior staining). We are one of only a few log home companies to offer a stockade or vertical style log home. I invite you to contact me (by making an appointment) so we can chat about your project. If you wish, you can forward me your floor plans (hand sketched is ok) and I can advise on how you can have that dream log home that best fits your need and budget. For you convenience, we have available a comprehensive suite of log wall pricing tools to help you balance your housing needs with your budget. 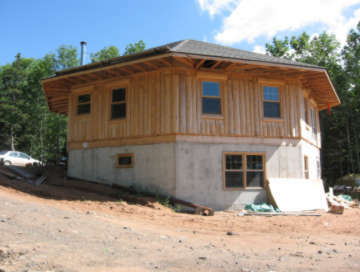 We want to break the misconception that all log homes are expensive. A new building season is upon us and we're now taking bookings for , with two potential customers interested. If you're interested in building this year please do not delay. Do like many have done, send an email or phone to get a price for your new log home package. Having purchased a beautiful piece of land on the North Mountain in Nova Scotia, we set about researching the possibility of achieving our dream of building our own log home. We were very excited about embarking on this project  especially never having built a home before! Joel and Janice Balsor of Stockade Style Log Homes were recommended to us and, right from our very first meeting with them, we could understand why. Having considered both stockade and traditional styles, we decided to go with a stockade style log home and whilst we had some ideas as to the design/layout that we would like,Joel and Janice worked with us to take these ideas forward, whilst providing invaluable input and advice to help us along the way. Throughout the whole process of the design, manufacture and erection of our home, Joel and Janice were extremely professional and helpful, always happy to answer our (many!) questions and requests for advice. Their commitment to providing the highest standards of workmanship and service was clearly evident. In addition, there were a number of occasions when they went above and beyond the call of duty in assisting us when we needed their help. We are absolutely delighted with our home. 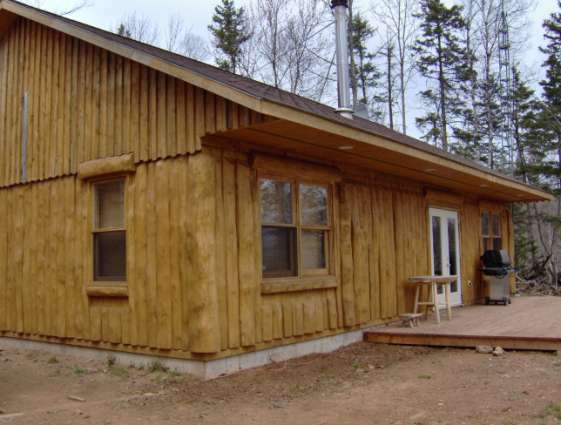 The quality of the workmanship provided by Stockade Style Log Homes is exceptional. We recommend Stockade Style Log Homes without hesitation. 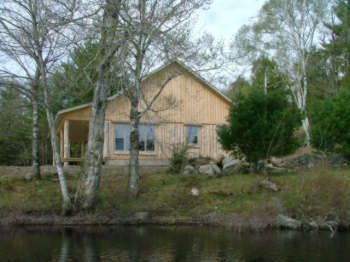 We purchased a property on the Medway River in Queens County, Nova Scotia in October 2007. There was an 81 year old log lodge on the property which we had hoped to renovate. After structural inspection we knew there was no other option but to remove it. 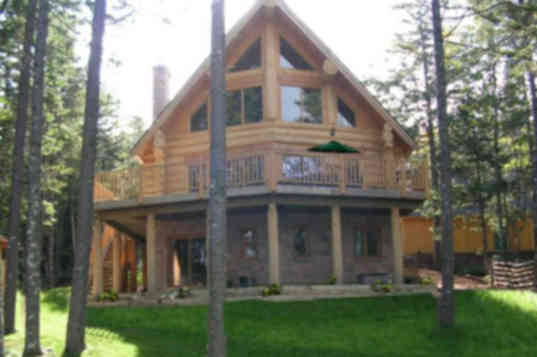 We started the search for a log cottage package because we knew no other type of structure would suit us or the site. We found Stockade Style Log Homes on the internet and discovered that the company not only constructed the "traditional" but a "stockade" style log home. The stockade style was of interest to us but we had questions as we were not familiar with the style. We called Joel and Janice Balsor, the company owners, who graciously offered to show us their home, built in the same style. Our visit erased any doubts - it was exactly what we were looking for. Joel immediately worked with our general contractor to design a cottage meeting our specifications. He prepared engineered plans which received immediate municipal approval. We couldn't have asked for a more cooperative relationship between Joel and our general contractor. The package was delivered on time, on budget and met all the specifications. Joel personally attended the building site with his crew to erect the structure. Throughout the project Joel and Janice were always available to answer questions and provide advice. The craftsmanship is impeccable. The log package exceeded our expectations. The hand hewn logs are each different in their own way but blend together perfectly - as if they always co-existed. The cottage is unique - exudes warmth and character. 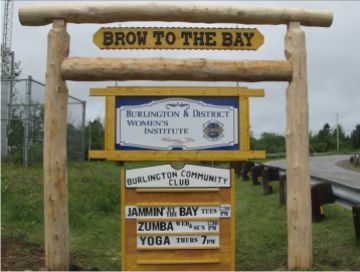 We look forward to spending quite a bit of our retirement time year round in our "Cottage on the Medway". We would highly recommend Stockade Style Log Homes and Joel and Janice Balsor to anyone interested in building a log cottage or home. My Husband and I are on a four year project renovating our 1930s farm house. We were looking for someone who had knowledge in timber framing so we could put timbers on the inside of our home. We came across Joel, with Stockade Style Log Homes and we found the right person. Joel had the knowledge of how to place the beams to make them look right and also to be structurally sound. He made the joints look like the beams had always been there and it was a natural fit for our farmhouse. Pictures of our home appear on Stockade Styles web site. The house is not finished yet, but when it is we would be happy to allow Joel to come back and take finished photos. We have an up-and-coming project of a Timber frame pool room and have asked Joel to be a part of this project as well. It was a great pleasure to work with Joel and his company and we look forward to many more projects to come. Joel Balsor of "Stockade Style Log Homes" did work for me on my log home, November 6th, 2006. He replaced some logs, put in three windows and did any required finishing work. I found Joel to be very professional and courteous. He did show that he has great experience, confidence, stayed focused on this task and enjoys what he does. I was impressed and pleased with the quality of his work; and the over all out come, I recommend him highly.